iOLAP is a strategic data consultancy specializing in big data, business intelligence and data warehousing strategy and solutions. "Working with the iOLAP team has been a true experience of real partnership. " They are fabulous partners for implementing business intelligence and truly want your business to succeed. Easy to work with during ALL phases of the project. Any future projects where I need an outside source, I will be contacting iOLAP. I can honestly say there was nothing during this entire project experience that I disliked. They were diligent with their tasks, efficient, always accessible, easy to work with and provided solid knowledge of business intelligence and the best practices that should be utilized. I worked with Nick Larsen and his team - fantastic group. 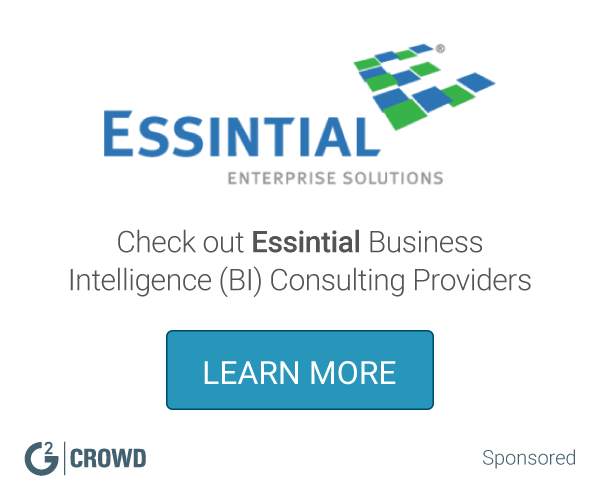 I would recommend them to anyone looking for a group to help establish a business intelligence area for their business or to improve their existing business intelligence process. "iOLAP understands the delicate intersection of business needs and tech limitations." They can put it in plain English and speak on business needs without getting lost in the tech-speak. Everyone on the tea is extremely easy to work with. I never encounter the stubbornness or condescension that can sometimes accompany tech companies at this level. Sometimes it is difficult to overcome deeply rooted tech limitations. At the executive level, we need solutions period. In some instances, the initial solutions offered are too broad in scope because they would require going back and undoing things in an impractical way. Once we get passed that, though, we are always able to find a solution that does work with the status quo. What Other AWS Consulting solution do you use? "iOLAP Provides Top Notch Work Product & Customer Service"
iOLAP has terrific focus on customer service and obviously prioritizes customer satisfaction. They have a "can do" attitude. They are a very intelligent bunch which has led to some insightful discussions and work shops. There really has been nothing to dislike. iOLAP is a versatile and capable group with skills and abilities beyond their stated strengths. They are honest when assessing new opportunities and seem to only take on responsibilities where they can really deliver great results. "Positive experience implementing Netezza "
iOLAP provided us with a very skilled resource for implementation and training. No specific dislikes come to mind, the experience was positive. iOLAP provides great service and is willing to work with you through all phases of the project. "iolap is an outstanding partner and has helped us surpass our organic growth goals." iolap is nimble and can quickly adapt to our ever-changing needs. They have the big business strategies and "thinkers" with the ability to prioritize and modify the deliverable and yet continually exceed our expectations. There isn't much to dislike! We need to better understand all of their capabilities. When we put their services in a box we soon learn that they have a team that can do much more. "Very talented and experienced resources! I recommend them 100%"
Staff is very knowledgeable, professional, they are very fast at capturing your business needs and creating a plan. They act and delivery quickly and they listen and understand all sort of environments and technologies. Nothing, this is a very good company, very easy to work with. This is a company you can trust, they will tell you exactly what you need or what you don't need. It is their approach that stands out. They focus on the users needs first, and filled in the technology around that. They're a technology shop that doesn't lead with technology. They lead with business needs and solutions. I'd like to work with them again. Hoping to find the right project. "iOLAP Delivers the Full Package"
iOlap was very thorough. They came prepared, they were very efficient, and delivered beyond our expectations. They are a true partner in the process. Only that I can't use them more! iOlap had a great deal to offer our organization(s). "Review of Business Objects Enterprise upgrade"
iOLAP was very collaborative and worked well with our team and leaders. Their staff had the precise knowledge we needed and performed well. Nothing, we were very happy with our results. The process of working with the iOLAP team including the offshore team was seamless. I don't have anything that surfaced with this project to justify a "dislike"
Best Hana resources after working with several other BI consulting vendors. "Very experienced with everything Business Intelligence related"
The best thing has been a combination of flexibility, expertise and knowledge. I am yet to find anything about iOLAP that I could dislike. Open, easy communication with simple straight answers around their area of expertise. "Honest, Engaging, intelligent and action oriented." Strategic direction behind the vision and communication streams. inability of the stakeholders to move past the first phase. Nothing. They have always done things well. * We monitor all iOLAP reviews to prevent fraudulent reviews and keep review quality high. We do not post reviews by company employees or direct competitors. Validated reviews require the user to submit a screenshot of the product containing their user ID, in order to verify a user is an actual user of the product. Hi there! Are you looking to implement a solution like iOLAP?